For other uses, see Serpico (disambiguation). Serpico is a 1973 American neo-noir biographical crime film directed by Sidney Lumet, and starring Al Pacino. Waldo Salt and Norman Wexler wrote the screenplay, adapting Peter Maas's biography of NYPD officer Frank Serpico, who went undercover to expose corruption in the police force. Both Maas's book and the film cover 12 years, 1960 to 1972. $29.8 million (North America) or $23.4 million. The film and principals were nominated for numerous awards, earning recognition for its score, direction, screenplay, and Pacino's performance. The film was also a commercial success. Prior to any work on the film, producer Martin Bregman had lunch with Peter Maas to discuss a film adaptation of his biography of Frank Serpico. Waldo Salt, a screenwriter, began to write the script, which director Sidney Lumet deemed to be too long. Another screenwriter, Norman Wexler, did the structural work followed by play lines. Director John G. Avildsen was originally slated to direct the movie, but was removed from production due to differences with producer Bregman. Lumet took the helm as director just before filming. The story was filmed in New York City. A total of 104 different locations in four of the five boroughs of the city (all except Staten Island) were used. An apartment at 5-7 Minetta Street in Manhattan's Greenwich Village was used as Serpico's residence, though he lived on Perry Street during the events depicted in the film. Lewisohn Stadium, which was closed at the time of filming, was used for one scene. 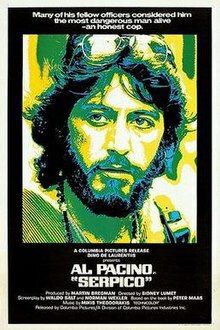 Serpico was a major commercial success, given the times and its modest budget, which ranged from $2.5 million to $3 million. It grossed $29.8 million at the domestic box office, making it the 12th highest-grossing film of 1973. Serpico was widely acclaimed by critics. At Rotten Tomatoes, it currently holds at a score of 90%, based on reviews from 39 critics, and an average rating of 8 out of 10. At Metacritic, which assigns a weighted average score out of 100 to reviews from mainstream critics, the film received an average score of 87 based on seven reviews. Pacino's role as Frank Serpico is ranked at #40 on the American Film Institute's AFI's 100 Years...100 Heroes & Villains list. Serpico is also ranked at #84 on the AFI's AFI's 100 Years...100 Cheers, a list of America's most inspiring films. The original score was composed by Mikis Theodorakis, nominated for both the Grammy Award for Best Score Soundtrack for Visual Media and the BAFTA Award for Best Film Music. Sidney Lumet's direction was nominated for both the BAFTA Award for Best Direction and the Directors Guild of America. The film was nominated for the Golden Globe Award for Best Motion Picture – Drama. The film also received Academy Awards nominations for Best Actor (Al Pacino) and Best Adapted Screenplay. The script won the Writers Guild Award for Best Adapted Screenplay. Pacino won his first Golden Globe award for Best Actor in 1974 for his performance in the film. He also received a BAFTA nomination for Best Actor in a Leading Role. Serpico was released on VHS and is available on Region 1 DVD since 2002 and Region 1 Blu-ray since 2013. The Masters of Cinema label have released the film in a Region B Blu-ray on 24 February 2014 in the United Kingdom. This version contains three video documentaries about the film, as well as a photo gallery with an audio commentary by director Sidney Lumet and a 44-page booklet. A weekly television series based on Maas' book and the motion picture was broadcast on NBC between September 1976 and February 1977, with David Birney playing the role of Frank Serpico. Only 14 episodes were broadcast, with one being unaired. The series was preceded by a pilot film, Serpico: The Deadly Game, which was broadcast in April 1976. ^ a b c Nixon, Rob. "Behind the Camera on SERPICO". Turner Classic Movies. Retrieved January 26, 2016. ^ a b Knoedelseder, William K., Jr (August 30, 1987). "De Laurentiis: Producer's Picture Darkens". Los Angeles Times. pp. 1–2. ^ a b "Serpico (1973)". Box Office Mojo. Retrieved January 26, 2016. ^ Rybin, Steven (2013). Michael Mann: Crime Auteur. Scarecrow Press. p. 139. ISBN 0810890844. ^ "Serpico". TheMobMuseum.org. Retrieved January 26, 2016. ^ a b c Nixon, Rob. "Serpico (1974)". Turner Classic Movies. Retrieved January 28, 2016. ^ a b c d "Serpico". American Film Institute. Retrieved January 26, 2016. ^ Kilgannon, Corey (January 22, 2010). "Serpico on Serpico". The New York Times. Retrieved January 26, 2016. ^ "Serpico (1973)". Rotten Tomatoes. Retrieved January 28, 2016. ^ "Serpico (re-release)". Metacritic. Retrieved January 26, 2016. ^ "AFI's 100 Years...100 Heroes & Villains". American Film Institute. Retrieved January 26, 2016. ^ "AFI's 100 Years...100 Cheers". American Film Institute. Retrieved January 26, 2016. ^ a b c d e f g "Serpico (1973): Awards". IMDb. Retrieved January 28, 2016. ^ a b "Serpico (1973): Company Credits". IMDb. Retrieved January 29, 2016. ^ "Serpico". Eureka Video. Retrieved January 26, 2016.